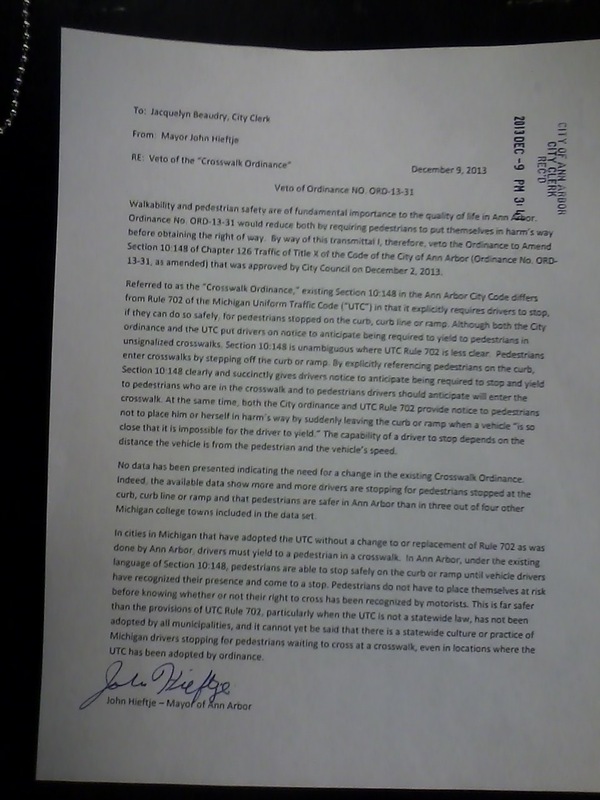 At 3:41 p.m. on Dec. 9, 2013, Ann Arbor mayor John Hieftje filed the veto of a revision to the city’s crosswalk ordinance that the city council had approved at its Dec. 2, 2013 meeting. The council had approved the significant amendment to the existing law on a 6-4 vote. The amendment would have eliminated the requirement that motorists extend the right-of-way to pedestrians at the curb or curb line – in addition to those within a crosswalk. It would have left in place the requirement that motorists stop, not just yield to pedestrians within a crosswalk. The complete filing runs a full page.